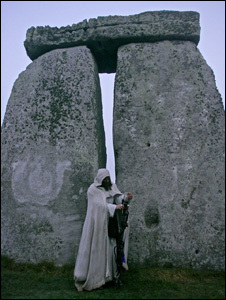 Druids celebrating the Winter Solstice at Stonehenge. monuments were also very likely to have been used at night for moonlit ceremonies. Dr. Andy Jones, who has been studying the Hendraburnick Quoit in Cornwall, has found that at this particular site, you can see at least 10 times as many markings on the engraved panel when viewed directly under the moonlight. Archaeologists have also discovered that at some point, people smashed up many pieces of quartz around the area which would have glowed in the dark and created a very unique effect at night. Dr. Andy Jones has been working in conjunction with the Cornwall Archaeological Unit and believes that this phenomenon is probably not limited to the Hendraburnick Quoit, but can also be found at other ancient stone monuments such as Stonehenge, as The Telegraph reported. After noticing some very specific markings on the stones that had never been seen before, Dr. Jones explained that the archaeological team then went out at night to photograph the ancient stone monument and discovered even more art which was only truly visible at night and beneath the moon. With the ancient quartz that is smashed all around the site, this would have created an eerily surreal atmosphere at night next to these ancient Neolithic stone monuments and would have lent magic to whatever nighttime ceremonies were performed at these locations. It is known that Stonehenge also has unusual markings which can only be seen at night, and archaeologists believe that many other stone monuments do as well. At the Hendraburnick Quoit in Cornwall, there had originally been 13 markings detected on the stone, but Dr. Andy Jones and his colleague Thomas Goskar discovered that there were actually 105 markings here when viewed under different light. Archaeologists now believe that it is extremely likely that nighttime ceremonies were conducted at ancient stone sites like this as the night was associated with the supernatural. Individuals involved in these ceremonies may have smashed the stones to release very special luminescent properties from them, which would explain the many pieces of quartz that have been found at ancient stone monuments like this. While Stonehenge and other ancient stone monuments are usually only studied by day, archaeologists will now be trying to discover what may have taken place during these special ceremonies that would have been conducted at night by way of moonlight.